I'm really have a fun time at the moment with new cleansers, not least because I have tried quite a few recently that I have been loving. And when I say cleansers, I am referring to ones that I am using as my second cleanse in the evening or my morning cleanse. Products that I am using to 'clean' my face, not products that are removing my makeup. There is only one product that sits in my bathroom cabinet for this job and its Clinique Take The Day Off Cleansing Balm. However, when it comes to second cleanses and morning cleanses I have been enjoying a few different products and just when I find one that I really like another one comes along that I like just as much. No big hardship here as I love to vary my cleansers depending on my mood and skin condition. I used to be satisfied with one cleanser but I've become as bit obsessed with having a few on the go at any one time. 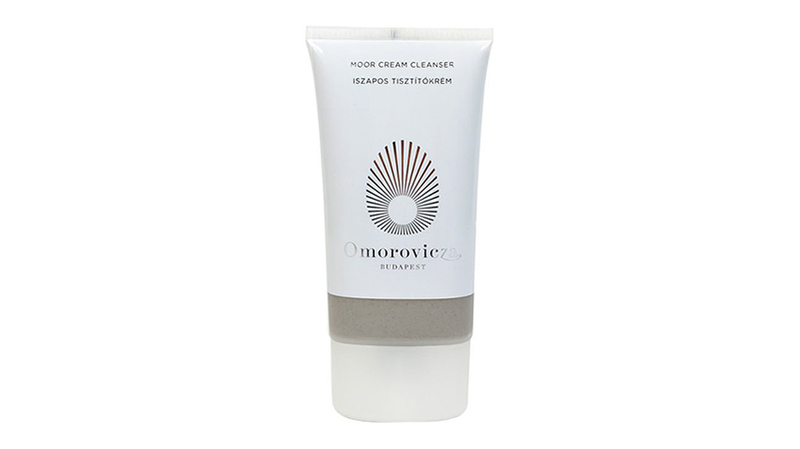 So, one of my recent finds is the Omorovicza Moor Cream Cleanser. Gorgeousness in a tube (and even better on your face!). Omoroviza have a deep cleansing mask with moor mud that is quite popular and does such a good job that some people only use it once a month. I love face masks but because I have dehydrated skin, I always lean towards hydrating masks and when it comes to deep cleansing, this is something that I like to keep on top of on a regular basis. So I got rather excited when I found this Moor Cream Cleanser, which is a deep pore cleanser that can be used on a daily basis. I use it about three times a week, perhaps on days when I have worn a lot of makeup and feel like my skin needs extra cleansing attention, or on mornings when I feel like my skin has produced too much oil/sweat during the night. This detoxifying cleanser gets right into the pores to eliminate impurities, not just the last traces of makeup but also environmental pollutants, those things that you can't see and are not even aware of, particularly if you live/work in a town or city. It is enriched with Hungarian moor mud from Lake Héviz, Europe's largest thermal lake, to leave skin cleansed, purified and smooth. It really leaves your skin looking brighter with a youthful glow, making it a great morning cleanser. Containing camphor, peppermint and eucalyptus essential oils, it has the most desirable scent and is suitable for sensitive skin types. It has a slight tingle to it once applied but in an invigorating way, the creamy consistency massages in beautifully and doesn't leave your face feeling tight. It is more pricey at £52 but if you are after a deep cleanse and only use it three times a week (which I think is sufficient), it will last longer than a daily cleanser. It's quite a therapeutic product which offers more than a regular cleanser so you expect to pay more. You can purchase Omoroviza at SpaceNK.